2019 Spring Clean Up will be here before you know it! Maintenance Days are Saturday, April 6th, April 13th, April 20th, April 27th, and May 4th. Rain dates are May 11th and May 18th. Please call or text Renee 302-547-4841 if you are able to volunteer before opening day. Bring your chainsaws, power washer, rakes, gloves and shovels, etc. Repairs this year will include putting a new roof on the bath house. Thank You! 2019 Dues are updated under Membership Information. The first installment will be due 3/15/19. All balances are due by May 1, 2019. Remember to update your contact and family member information on your invoice. Please email Renee at nap830@comcast.net with updated email addresses to ensure you don't miss out on announcements. A $100 annual maintance fee is due with all membership renewals. Work a minimum of 5 hours during one of our clean up days and $50 of the fee will be refunded along with $60 in guest passes. The full $100 will be retained if families do not work the required 5 hours. The maintance fee is waived the first year (for new members only). Follow our official Facebook Page to keep up to date with breaking news, weather closings, and social events at High Point Pool Delaware. Everyone in! 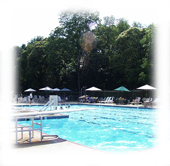 - High Point Pool opens May 25, 2019 at 12 noon! Interested in joining swim team? Contact our coaches Olivia Das and Doug Gardner at Olivia384217@gmail.com for details. Practice will start June 3rd from 4-5:15 PM. The first meet of the season is Thursday, June 20th. The pool will close in 2019 at 3pm on the following dates when we host our home swim team meets: June 27th (Green Acres), July 9th (Windy Bush), and July 11th (Darley). Members are welcome to use the opposing team's pool. Just tell their lifeguards on duty you are from Highpoint. Swim Lessons (Beginners thru Stroke Mechanics) - Session #1 Monday through Thursday, (8) 1/2 hour sessions starting on June 10th through June 20st 11:00 - 11:30am or 11:30 - noon. The cost is $100, payable to the instructor at the 1st lesson. Sign up at the pool with the life guards on duty. You can also arrange for private lessons at a more convenient time. See Life Guard on duty for information on how to sign up. High Point Swim Club closes on Labor Day September 2, 2019 at 7pm for the season - Thank you for another great season and looking forward to seeing ALL of you next year!